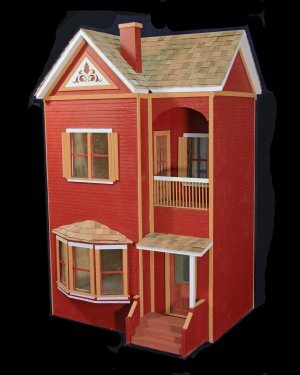 The Belmont dollhouse is a sweet two-story cottage and features five rooms Open to the rear. The kit comes complete with a bay windoe and includes a full foundation; laser cut porch railing; a porch post; second floor porch railing; exterior stairs; milled-in clapboard siding; three classic single windows; one classic window with shutters; a double classic window with shutters; a classic French door and a classic front door. The Belmont is made from 3/8" thick Baltic birch plywood and has a shipping weight of 20 lbs.